I don’t switch up my shampoo & conditioner that often as I have quite dry, frizzy generally unmanageable hair and when I find a duo that works I stick to it, but when these bright green bottles landed on my doorstep I was intrigued. Organix now known as OGX is a brand I have seen before & I’ve read quite a few good reviews of their Moroccan Argan Oil range. I have been trying these two for a month now and thought it was high time I shared my thoughts. 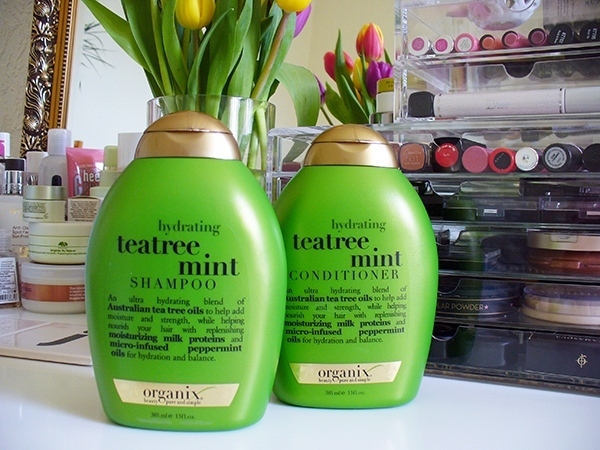 The OGX Tea Tree & Mint shampoo & conditioner* new for Spring & Summer make a great duo, at first the Shampoo was a little drying but after a week of using it my hair felt hydrated and healthy but I do like to use them both together and think they work better that way. I see the best results after I follow up with the TeaTree Mint Conditioner. These are both light green in colour which was a nice surprise and if like me you normally shower whilst you’re still half asleep the scent of these will wake you up, they have a real energising zingy minty scent perfect for early morning showers. They are a blend of Australian tea tree oils, moisturising milk protein and peppermint oils & together this duo left my hair glossy, smooth and smelling amazing. I also noticed my curls had a healthy bounce to them, but only if I used the conditioner too. This is a lovely final step especially if you like your hair to look silky smooth. If you have dry/thick hair these will be perfect for you as they add a boost of moisture and also strengthen your hair to minimise breakage. They’re also very gentle for the scalp. Think of them as a 3 in 1 treat for your hair as they hydrate, strengthen and give balance. These are sulphate free (best for locking moisture in), paraben free and cruelty-free. The shampoo doesn’t lather up a great amount but I find that it is easier to wash out, I leave the conditioner on for as long as I can, almost like a hair mask. Afterwards, I find my hair is very glossy (that’s my tip, try to leave it on for as long as you can). These are big 385ml bottles and will last you ages, I try to only wash my hair every 3 days so even after 5 weeks I don’t think I have made a dent in these. I have also noticed my husband’s been sneakily using them (I can smell the mint wafting out of the bathroom), so if he likes it then they must be good. OGX hair care (formally Organix) is available from www.waitrose.com for £6.99. They have a wide range of products to cater to your personal hair care needs whether your hair is – frizzy, straight, dry, oily, too fine, too thick or just in need of some TLC.